The easiest way to get to Lake Tahoe is to fly to Reno Airport. Once you are arrive, you will need to take a shuttle to your resort area, or if you want the convenience of your own automobile, you can rent a car in lake tahoe There are quite a few car rental companies in Lake Tahoe that service both North Shore and South Shore. Help keep our environment clean, take public transportation whenever possible. Shuttles from the airport are easy. If you choose to take a shuttle there are any number of shuttle companies that can serve your needs. 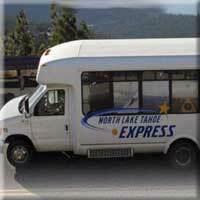 From the airport North Lake Tahoe Shuttle Service can take you around various place on the lake. They are inexpensive, convenient, and they have great pick up - drop off times. We recommend them highly. Here is the shuttle route map. There are a number of shuttles you can ride from Reno Airport. These companies service the South Lake Tahoe area.